Anti-deportation campaigners watched in despair last Wednesday night as almost 20 women were forcibly taken to the airport to be removed from the UK aboard a bus branded ‘Just Go!’. They were driven from Yarl’s Wood immigration prison to join a mass deportation of over 50 Nigerians. Some still had outstanding appeals against deportation. Some of the women on the flight had lived in the UK for over 20 years and were respected pillars of their community. Now they will be on the street in Lagos likely with nowhere to go, few belongings and ‘their lives in tatters’, according to supporters. “This is a disgusting and racist way to treat humans,” said the activist. 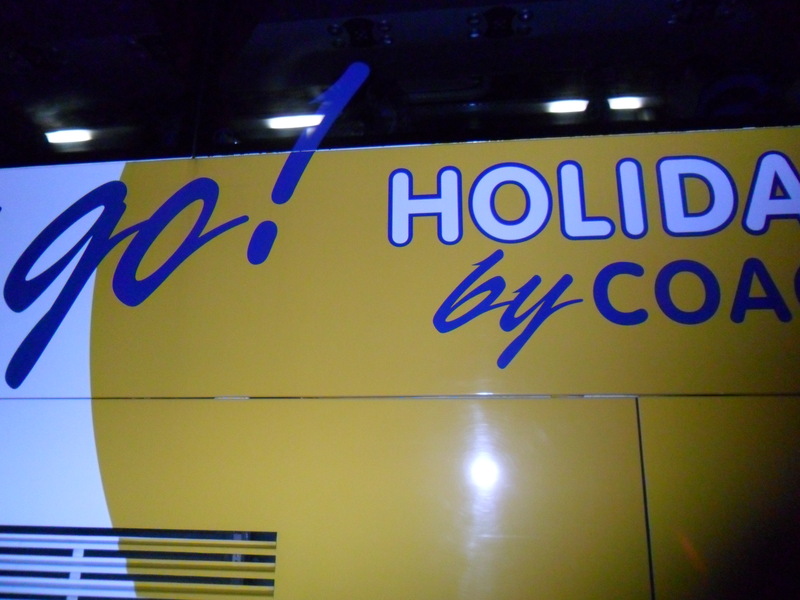 The bus company ‘JustGo’ claims to offer ‘interesting and rewarding excursions’ to a range of locations in the UK and Europe. One-way travel to Nigeria is not advertised. Just Go chief executive Luis Arteaga could not be reached for comment. Mass deportations to Nigeria occur bi-monthly. The UK’s Border Agency refers to these collective expulsions as ‘Operation Majestic’. 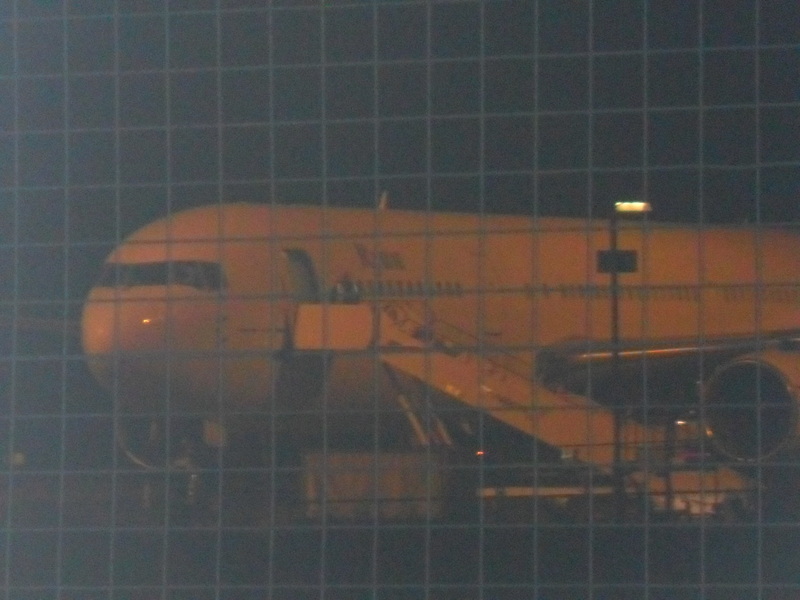 Planes typically leave London late at night with two private guards flanking each detainee. While removal decisions are made by the Government and courts, the logistics of forcibly deporting people are handled by an army of private companies. Campaigners recorded the involvement of at least seven other private contractors during the deportations. 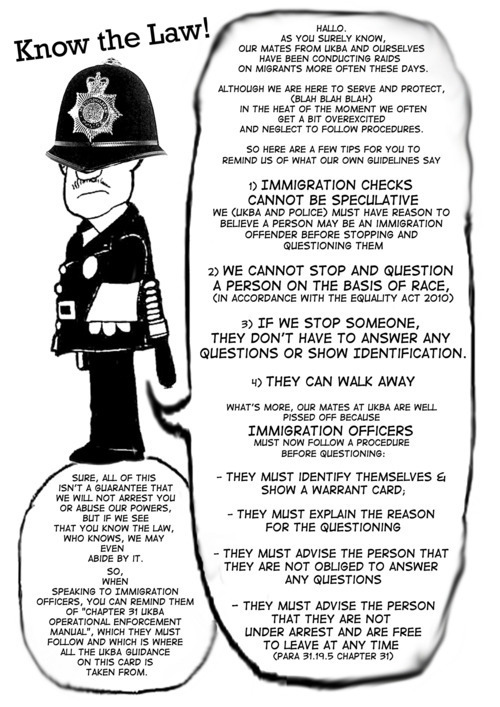 Detention centres are also run by private contractors, such as Serco, G4S and GEO. The only evidence of state involvement in the expulsion was a single Ford Focus with a small ‘UKBA’ sticker on the door. “The State’s monopoly on violence has been farmed out to gangs of eager mercenaries. Watching the reality of a mass deportation makes the right-wing claim that ‘migrants take our jobs’ even harder to swallow. What we saw was hundreds of burly white men being employed to kick out half as many black people,” said an eyewitness, adding: “They expelled them from a country of relative economic prosperity to one riddled with severe poverty. Several large companies oversaw the process. Many of them are headquartered in the UK. We saw the deportation industry at work – it’s a major, profitable business venture”. 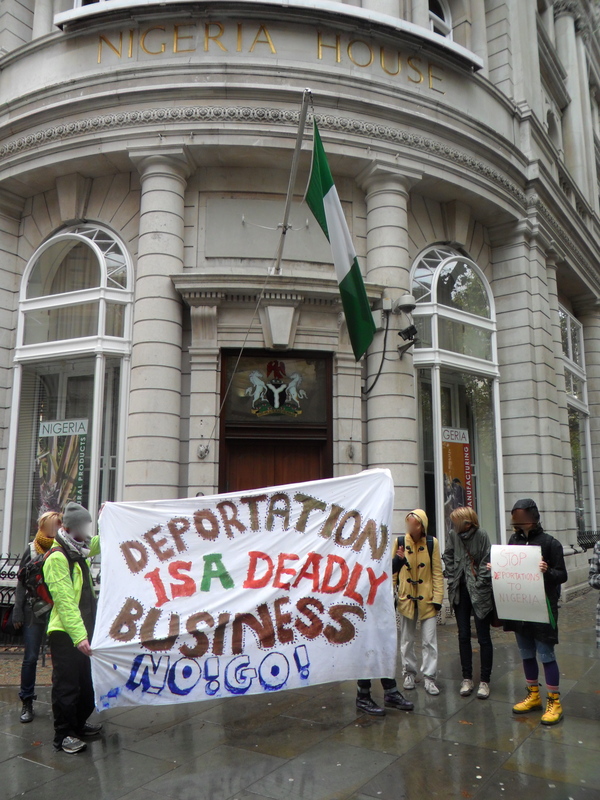 Earlier that day, angry protests had erupted outside the Nigerian high commission as activists denounced Nigerian government complicity in forced removals of immigration prisoners. The demonstration had been called for by some of the women detained at Yarl’s Wood. They had hoped that an eleventh hour protest would “shame diplomatic staff into withdrawing their consent for the deportation”. A spokesperson for the protesters said: “The women are put on the planes only due to the generous collaboration of the Nigerian authorities, which reportedly sends an official from the mission to issue detainees with emergency travel documents”. Staff at the high commission promised that a representative of the Nigerian immigration service would address the crowd – they never appeared. One Nigerian bystander at the commission protest had first-hand experience of a similar mass deportation from Ireland to Nigeria. She described the Nigerian government as “useless,” adding that they: “Allow it [deportations] to happen.” Nigerian officials are understood to assist British authorities with mass deportations by issuing travel documents in return for cash payments and other sweeteners. Though no resistance was reported inside Yarl’s Wood on this occasion, one of the detainees facing deportation said, “Everyone is scared…it’s just too much.” Yarl’s Wood managers allegedly warned every detainee set to be removed that resistance would be “dealt with harshly”. “Deportees are dehumanised throughout. They’re robbed of their personalities as soon as they encounter the authorities. They’re immediately reduced to ‘illegal immigrants’. This makes it OK for them to be detained in immigration prisons for years,” said another eyewitness, adding: “They have become mere files. Sat in boxes. Trapped in a warehouse, while a paperwork battle rages to decide their future. Finally a decision is made, and the boxes are shipped to the airport, flown far away and literally dumped in a foreign cargo terminal. It’s staggering how clinical the whole process was – humanity was nowhere to be seen”. Mass deportation flights have become a preferred way of removing migrants to poorer and more dangerous areas en masse. They are intended to save money though also keep deportations outside the public gaze. “The emphasis of mass deportations is on filling the flight and ‘getting rid of as many, as soon as possible,” said one member of Soas’ detainee support group. Five women were given last-minute reprieves when they were removed from the airport bound coaches at Yarl’s Wood, according to DeportationWatch. The removal and protest come on the back of the anniversary of the death of Jimmy Mubenga who died while he was being restrained by guards on a removal flight last year. A report issued last month after prison inspectors accompanied two flights showed that dangerous behaviour among guards has not stopped. “Inspectors were very concerned at the highly offensive and sometimes racist language they heard staff use between themselves,” said chief inspector of prisons Nick Hardwick. The report sharply criticised the use of handcuffs on detainees “who appeared upset, or who were moving too slowly, despite there being no signs of any violent behaviour which might have justified the use of such restraints”. Inspectors blamed a lack of training for the violations. Lawyers have long argued the use of excessive force by private contractors to restrain detainees could be a violation of basic human rights. One immigration detainee described how her friend was “beaten and handcuffed” before being bundled into a prison van “like a terrorist”. Human Rights Watch said in 2009 that Nigerian security forces: “Continued to commit extrajudicial killings, torture, and extortion. Intercommunal and political violence, often fomented by powerful politicians, claimed hundreds of lives.” Despite this, British authorities routinely dismiss humanitarian and political asylum cases from Nigeria as ‘unfounded’. Evidence of torture has previously been ignored as in one case where a decision on asylum was reached before a medical assessment which proved that the detainee had been brutally tortured in Nigeria. One detainee says she believes the treatment of illegal immigrants like her has deteriorated since David Cameron’s call at the Conservative party conference for members of the public to denounce those suspected of being in the UK illegally to the authorities. “They don’t want us here – they are being racist,” she said. The Home Office could not be reached for comment.